Our Doorways Love Window Treatments, Too! You have all of your windows covered, but now you need to think about all of the doors around your home that have windows in them. Commonly overlooked, many doors around the home have windows, whether it be an expansive sliding glass door in your family room or a simple side door in your laundry room. 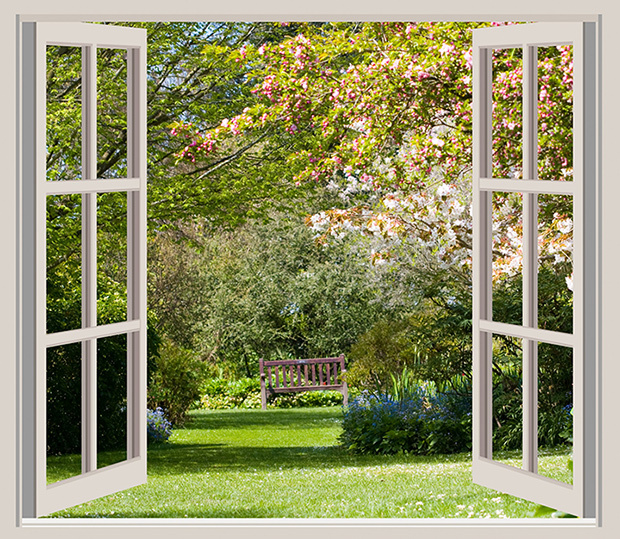 Windows in doors let in as much light and effect the internal temperature of your home as much as standard windows do. With just a couple of considerations, these windows may be covered as well with a vast variety of window treatments to choose from. There is often concern about covering sliding glass doors because many people think that due to their sheer size, their only option is vertical blinds. Vinyl vertical blinds certainly get the job done but they are absolutely not the only available option. Standard PVC vertical blinds are effective at light control, but many people aren’t fond of the loud click-clack noise they make when opening and closing. If you consider this noise a nuisance, fabric vertical blinds perform exactly the same way but the fabric vanes don’t make the same noise vinyl vertical blinds make. A growing trend in covering sliding glass doors is sliding panels, also known as panel track blinds. This blind is made up of a custom number of fabric panels that slide on a track to open and close. Sliding panels provide a clean and updated look for large doors and windows. Different fabric selections can transform this treatment into a sleek, contemporary accent or a colorful transitional home accessory. Another option is vertical cellular shades, sometimes referred to as cellular sliders, which are essentially a cellular shade turned on its side. These are ideal for large doors that may contribute to heat loss or gain around the home. The cellular pockets trap the air and create an insulating barrier between the glass and the interior of the home. Recommended to be installed to open and close in the same direction of the door operates, these condense into an unobtrusive stack when not in use. French Doors are lovely as a gateway to a patio or backyard. Being able to open two doors to allow the breeze to flow inside is a pleasant feature in a home. Typically, French doors have windows. Just because these windows are on doors, doesn’t mean that they shouldn’t be covered. Whether for increased privacy or for light control, adding window treatments to French doors adds a functional and decorative accent to your carefully designed rooms. A wide range of window treatments are suitable for French doors. Because most doors don’t have window frames for the shades to be mounted in, blinds or shades for this application typically need to be ordered as an outside mount. Also, because doors with windows are obviously mobile, it is highly recommended to order and install hold down brackets on the bottom of the treatment. These will keep the blinds and shades in place while the door is opened and closed. Sheer shades, woven wood shades, Roman shades, and wood blinds all make stunning and practical additions to French doors. Single standard hinge doors welcome the same type of window treatments that work well on French doors. Roman shades add a soft and cozy component to doors with windows. Roller shades are more minimal but function equally well. For optimum light control, choose wood blinds which may be raised or lowered completely and have slats that tilt to manipulate the light in any direction. Doors with lever handles and windows that span the height of a door, will require blinds or shades with a shallow depth. Always be sure to double-check the clearance, but most 1” wood blinds, roller shades, and cellular shades will allow enough room for a lever door handle to operate smoothly. Dutch doors add a charming and whimsical touch to a front or back entryway. They are ideal for welcoming in the fresh air, while keeping the kids in and the pets out, or the other way around! If a Dutch door has a window then adding a window treatment is a simple way to add even more charm to this cottage inspired detail. Roller shades are a good idea for a casual environment while a Roman shade would be more decorative and bring a little more attention to the door. The beauty of window treatments suitable for doors with windows, like a French door, or doors that are windows, like a sliding glass door, is that there is sure to be a coordinating shade for other standard windows in the same room. Don’t feel like you have a door standing in your way from tying your whole room together into the look you want. Season 1871–72 marked the first occasion in which any football team from Scotland participated in official competition, either at club or international level, when Queen's Park, the foremost club of the day, entered the inaugural FA Cup.